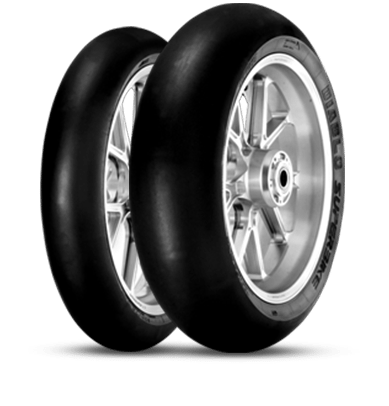 RACETEC™ RR SLICK is dedicated to all those riders involved with racing activity on race track or at road races where rules allow the employment of a NHS tyre, and require the extra performances given by a pure slick product. Due to its dynamical performances and durability, RACETEC™ RR SLICK is perfect for either the race day or when training (professional riders). 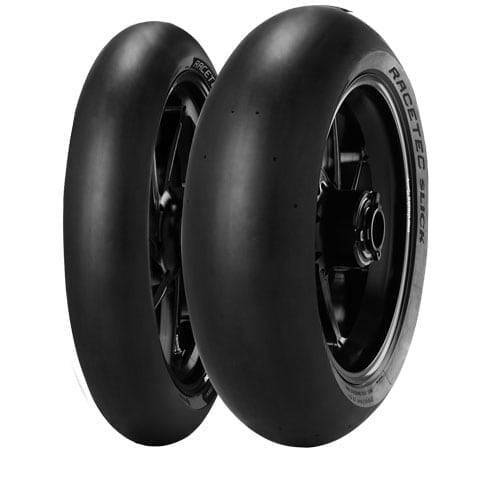 METZELER RACETEC™ RR SLICK features a new profile with increased height ratio, resulting in a wider contact patch effectively increasing adherence in all riding situations. The new profile, coupled with INTERACT™ patented steel belt technology, also provides enhanced agility and contact feeling, increasing riding easiness. Structural design and INTERACT™ steel belt technology enables RACETEC™ RR SLICK racing performances to adapt to different motorcycles and settings, providing a fit & play racing experience. Compound versatility allows for a wider optimal employment window in terms of asphalt severity and temperature.